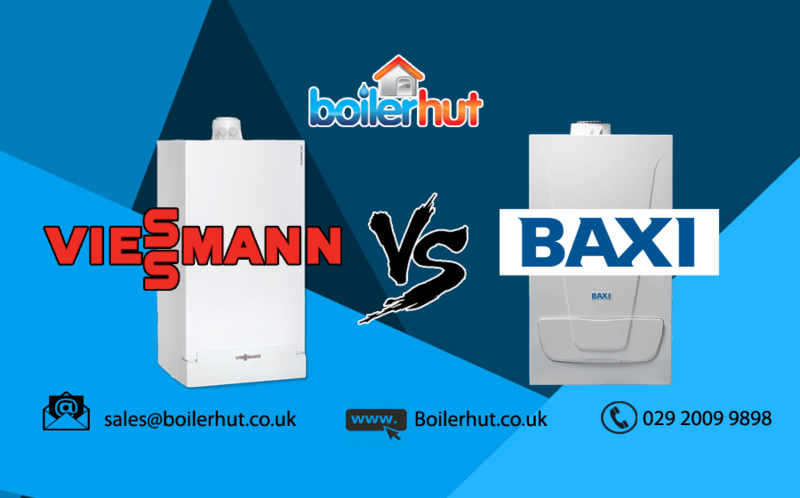 Baxi vs Viessmann | Which is the better, more efficient condensing boiler? 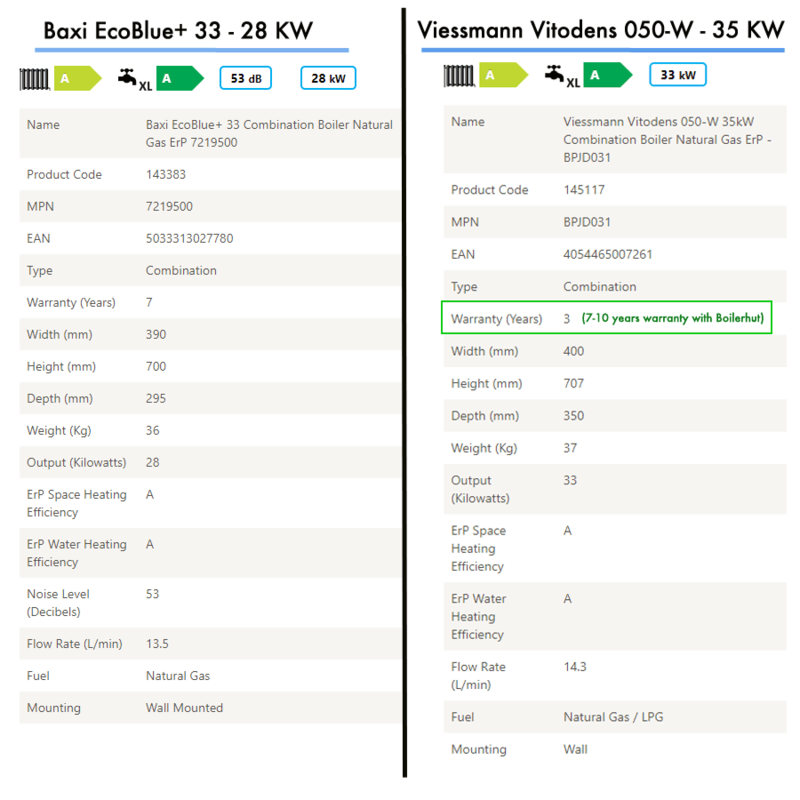 Baxi vs Viessmann – Which is the better boiler? *Please note that what you will get is just an online estimate, and our final quote will be lower, subject to survey. If you’re on the market for a new boiler, chances are you might be looking at online reviews for Baxi vs Viessmann. Which is probably why you’ve ended up on this page. Online research is now a big part of buying decisions worldwide. As part of a team of engineers and installers with over 40 years of experience, we have installed all kinds of boilers, from Worcester Bosch to Vaillant to Baxi vs Viessmann, and it is in our best interest to be as unbiased as possible, and to present as many facts to you as we can. Because at the end of the day, after we install these boilers, it is our responsibility to ensure that they’re running smoothly, and that there are no complaints whatsoever. Now don’t get me wrong, as it goes with ever-involving technology, and especially condensing boiler technology, things can still go wrong. Which is where engineering, efficiency and internal components can oftentimes make the biggest difference. On the surface these boilers may all look the same, but there are major differences underneath. Which is why we can’t give you a simple and straightforward answer in one paragraph. With over 40 years of boiler installation, replacement and maintenance experience, we’ll try our best to illustrate key differences and pros and cons for you to choose between Baxi vs Viessmann. Is Baxi really British? Should your buying decision be based on national/local pride? While the word “Viessmann” definitely sounds German, and it is, many people believe Baxi is completely British. It is not entirely. Baxi is part of BDR Thermea who are based in Apeldoorn, the Netherlands. The fact that many people in the UK make their buying decision assuming Baxi is 100% UK based is a bit mind boggling. Sure, Baxi are a great company, and have great history and reputation in the UK. But in 2017, Viessmann are as UK based as Baxi. While it’s true that brands like Baxi, Worcester Bosch and Ideal have been well known names in the UK boiler industry for a very long time now, Viessmann are market leaders in the European residential and commercial heating space. In fact, their market share in Germany is a whopping 70%-80%. Not only that, they are world leaders in the commercial heating space. Cardiff’s Millennium Stadium is kept warm by Viessmann’s commercial heating solutions. Their foray into the residential heating space has been fairly recent, but you can expect great things. Viessmann got a bit of a flack initially due to non-availability of parts, but they soon remedied that by opening up headquarters in Telford, Shropshire and making their parts readily available all over the UK. National pride aside, in the global market we should make our decisions based on merit. There are countless German brands in the top 500 in the world. But when we’re talking about boilers and engineering and efficiency, car manufacturers can be considered a proper and similar benchmark. One look at major worldwide German car brands like Mercedes-Benz, BMW, Audi, Porsche, Volkswagen etc., words like quality, engineering, efficiency, futuristic technology etc. etc. pop up in our minds. And with good reason. The Germans have been making technologically superior, highly efficient cars for the past 100 years. The tech found in Mercedes-Benz cars in the 80s didn’t make its way into other road cars around the world until the late 90s! Mercedes-Benz powered hybrid Formula 1 cars have won the last 4 World Championships. Nobody has been able to beat Porsche or Audi since 2010 in the Le Mans 24 hours race! One of UK’s highest selling boiler brands, Worcester Bosch, is part of Bosch (a German company) since 1992. Vaillant, another major boiler manufacturer in the UK, is German. Conclusion: Baxi is a better known brand in the UK, but Viessmann is catching up. Baxi have been operational for over 150 years. The Baxi Bermuda back boiler was hugely successful and was discontinued recently. Baxi are a solid company with a rich history and a century and a half of experience. They employ about 6,400 people throughout Europe. Baxi are, without a doubt, a well known brand name in the UK, and are now expanding to other parts of Europe. Viessmann have been operational since 1917, and now have over 12,000 employees across the world. They are present in 12 countries with 23 production divisions, subsidiaries and representations in 74 countries, and 120 sales offices around the world. As mentioned above, they are one of the biggest companies worldwide in the commercial heating space. Why Viessmann is relatively unknown in the UK market is because they entered the market much later than their competitors, only in 1989. In a short period of time, with their innovative solutions, high quality internal components and long-term warranties have made quite an impact on the UK market. *Please note, the prices given below are for boilers only. The final price for a boiler installation will include labour costs, extras like chemical flush, magnetic and limescale filters, and thermostats etc. The Viessmann boiler (35kw compared to 28kw for the Baxi) is cheaper by exactly £100. Viessmann are able to provide a more competitive price point by manufacturing all their internal components (including the Inox-radial stainless steel heat exchanger) in-house. Whereas all other boiler manufacturers source their internal components from third-party providers. Like the Giannoni aluminum heat exchanger, which is used by pretty much 80% of the boiler manufacturers in the UK, and is known to cause a lot of problems. Conclusion: Viessmann boiler is cheaper and technologically superior. *If installed by a Viessmann trained installer. As mentioned above under price, Viessmann manufacture a lot of their internal components themselves, which helps them keep their price down. Which also means they can use better, higher efficiency, more corrosion resistant material like stainless steel for their heat exchangers, compared to aluminum for their competitors. Which ultimately helps them offer better and longer warranties, if installed by Viessmann approved and trained installers like Boilerhut. You also get exclusive discounts. Conclusion – Similar warranty on parts and labour, but Viessmann offers better quality and longer warranty on the heat exchanger. The internal working components inside a boiler have to tolerate very high levels of thermal and mechanical stress, various types of system water qualities and dissolved oxygen. At its highest working capacity, it’s like a volcano or a furnace inside a boiler, which means it makes a huge difference if the internal components are made from the highest quality materials. Pictured above is an Inox-radial stainless steel heat exchanger pioneered and manufactured in-house by Viessmann for all their boilers. 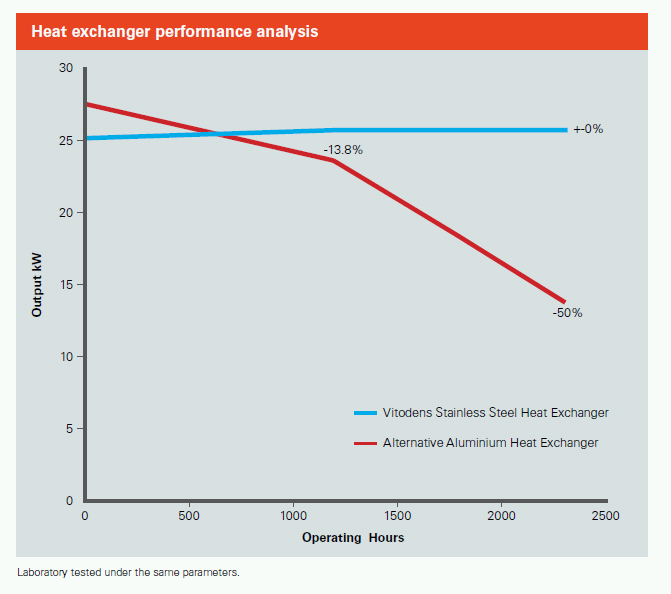 Viessmann and Vokera are the only two boiler manufacturers we know that use a stainless steel heat exchanger. Viessmann boilers are more compact because the condensate and pressure relief pipe is combined. That makes it easier to cite the boiler, and it can fit in tight spaces a bit better. Baxi have made great inroads into the compactness of their boilers as well, which makes it easier to cite their boilers too. 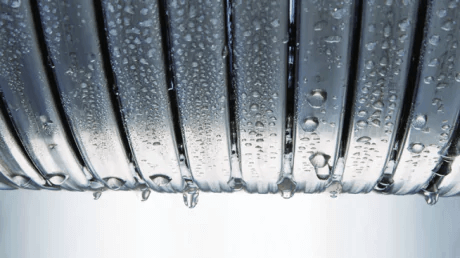 A lot of the other boiler manufacturers in the UK use an aluminium heat exchanger made by a third-party supplier called Giannoni which has been known to cause a lot of problems. If you do a simple Google search regarding the same, you will see lots of complaints regarding horrible clogging within just a year of use. That being said, regular maintenance and cleaning is key to make any internal component last, whether it’s a boiler or a car engine. If you get regular annual service done for your boilers, you not only preserve manufacturer’s warranty, you also ensure your condensing boiler, whether Baxi vs Viessmann or any other brand, works at its highest efficiency for as long as possible. Which in turn saves you money on energy bills and gives you more consistent heating and non-stop hot water. From time to time you will experience (we hope not) loud rattling of your water pipes every time you open a tap in your house. If your roommate is taking a shower at 6:00 in the morning, it will wake everybody in the house up, trust us. Water hammer is a pressure surge or wave caused when a fluid (usually a liquid but sometimes also a gas) in motion is forced to stop or change direction suddenly (momentum change). A water hammer commonly occurs when a valve closes suddenly at an end of a pipeline system, and a pressure wave propagates in the pipe. It is also called hydraulic shock. Viessmann have built shock arresters right into their boilers, reducing, limiting, or even avoiding the water hammer problem all together. Anybody who’s experienced a water hammer problem knows what a nuisance it is, as mentioned above. Basically it’s like someone hammering your walls every time there’s a tap opened anywhere in the house. Viessmann is cheaper by £100 and with a higher output of 35 KW. Inox-radial stainless steel heat exchanger is more durable, efficient and highly corrosion resistant. Viessmann offers 10 years warranty on the heat exchanger if installed by a Viessmann Trained Installer like Boilerhut. Overall Winner – Viessmann (but by a little margin). Can’t afford a boiler right now, and you’re on benefits? 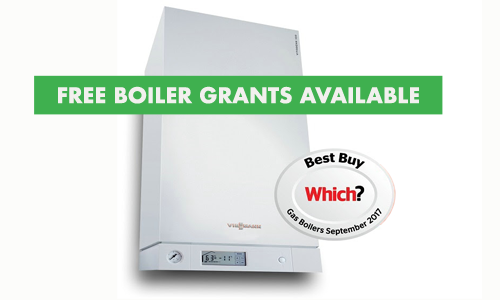 You might qualify for a FREE Boiler Grant. You can also call us on 029 2009 9898. We’re open 9:00 am to 5:00 pm Mon-Fri.